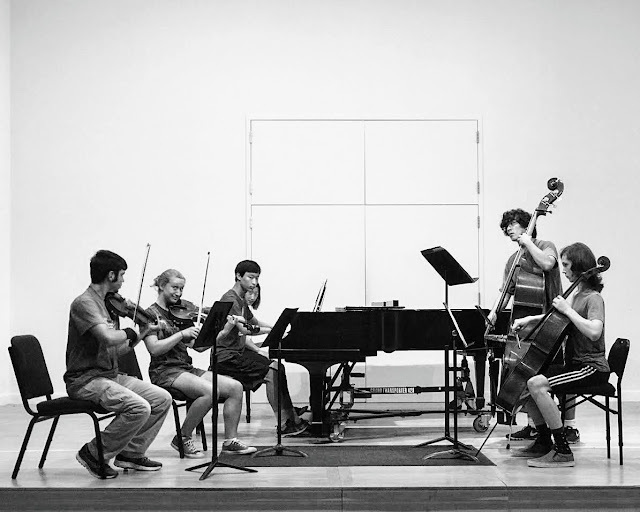 Chamber music has always been part of my life, starting with piano duets with fellow students as a child and moving to larger groups as an adult. Because what’s better than playing music by yourself? Playing in a group or course. There’s nothing so magical as playing completely in sync with other musicians, playing in harmony, breathing as one, passing themes back and forth. During rehearsals, we always laugh at funny mistakes and cheer at perfect endings. Every once in a while, in rehearsal with really good players, the music is so overwhelmingly beautiful that you feel you’ve just touched the divine. You can close your eyes for a split second and everything is completely right with the world. You breathe in and hold your breath hoping to hang onto the sense of euphoria. It must be like an opioid high, but ever so brief. Then the music will carry you back to reality, as it is inherently rooted in the present time. Listen to this spot in the Schubert Trio Op. 99 for a minute as an example. When Adam played the violin as his main instrument, we played several sonatas for violin and piano by Mozart and Beethoven. These are not violin sonatas with piano accompaniment but really chamber works as both instruments are equally important. It's a pet peeve when someone compliments my "piano accompaniment". If the music is specifically written as chamber music for piano and not a symphonic reduction for a concerto, it is not accompaniment! 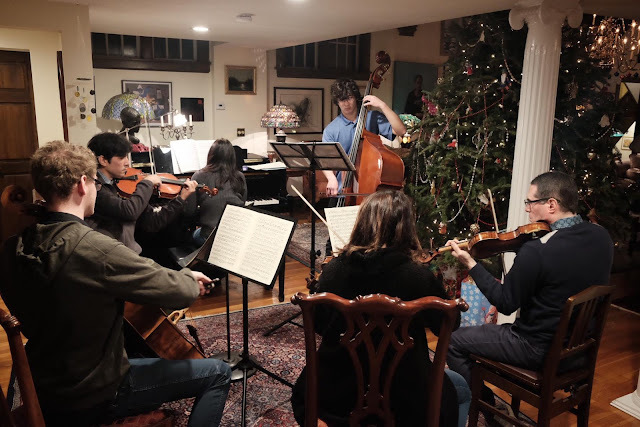 (Now stepping down from the soapbox...) I had always hoped to play chamber music with Adam in larger groups but he had moved on to playing the bass where there is a lot less chamber music and he had also become a busy high schooler. One of my lifelong dreams is to play the Schubert Trout quintet. After playing in piano trios for years, I joined a string quartet at my music school and suggested the Trout. I had the Music Minus One version and was never able to play it up to tempo with the CD, but thought I could handle it with real people. Little did I know that this quintet was scored for violin, viola, cello, and bass. 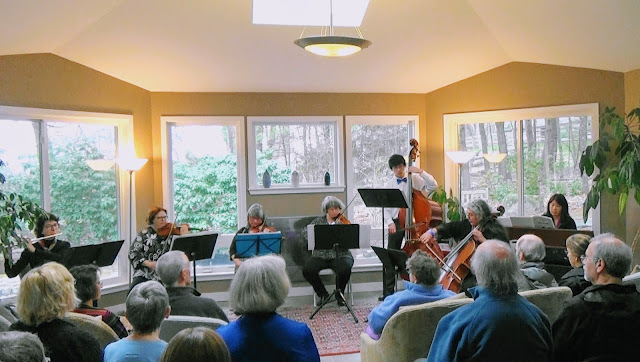 The coach (a cellist) expressed her concern about trying to combine the cello and bass parts or shifting everyone to play a lower part (2nd violin to viola, viola to cello) which would be a lot of work. When I heard this, I suggested that Adam play the bass part especially since he was already at the music school for his lesson. Just a few minutes later, he was playing with our group. It was a double dream come true for me, playing the Trout quintet and playing it with my son! I was in chamber music heaven. It was such a thrill! A couple months later, we were at a party of another chamber coach, a professional musician, who specifically asked everyone to bring instruments and music to play. On the drive over, I was so excited to have Adam possibly play with us. I kept exclaiming, "This is it! This is living the life before technology, where people could only entertain themselves by playing music together. This is my dream to be able to play like this for fun with professional musicians!" Adam was not so keen on this "ultimate party". When we arrived, he was extremely reluctant to take his bass out and I had to have a student cellist in the Boston Conservatory who he knew give him a pep talk. When one of the hosts asked who was available to play with which instruments, I mentioned that Adam played the bass, and his eyes immediately lit up and he said, "Trout!" Moments later, here we are living the dream (doubled up violins). And we got to perform the Trout again in a lovely bucolic setting in Harvard MA (with even more varied instruments). The A and A-flat keys were sticky on this not-so-lovely electric Roland piano, but at least the pedal didn't wander away. We also played the Bach Brandenburg Concerto No. 4 (had to hunt for the harpsichord voice, number 66 on the Roland). Over the summer I convinced Adam to enroll in a chamber music camp, where he was really in his element. 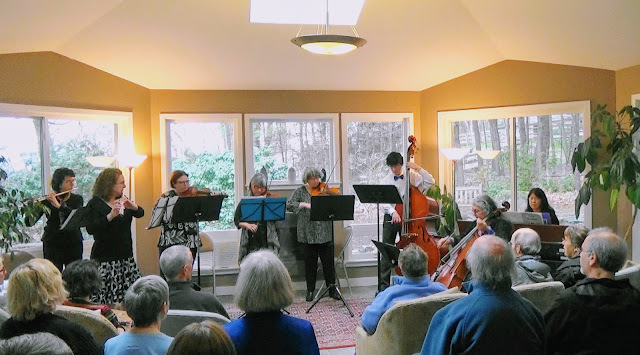 They played movements from the Dvorak Bass Quintet and Hummel Piano Quintet. I love this photo because you can actually feel the collaboration going on. The performances were magnificent! I was so glad that Adam got his own taste of the chamber music life.